Preheat oven to 180C. Grease and line a 3cm-deep, 20cm x 30cm (base measurement) lamington pan with baking paper, allowing 2cm of paper to overhang at long ends. 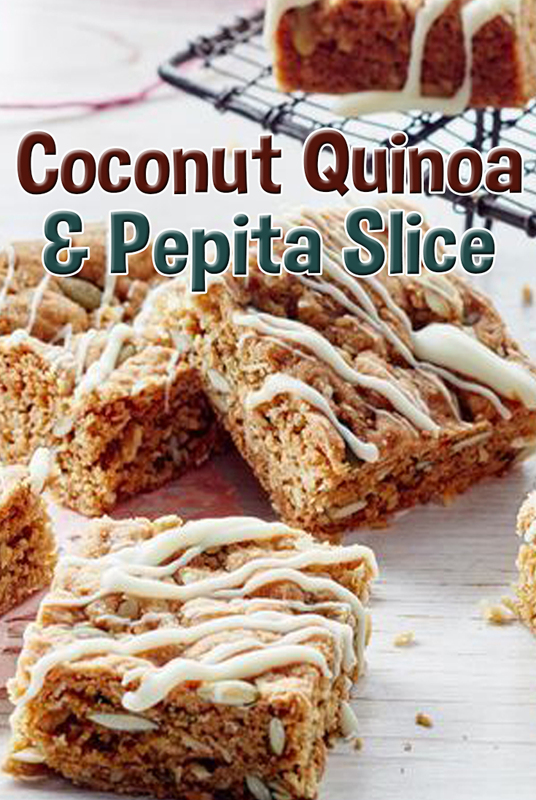 Combine the flour, pepitas, oats, quinoa flakes, sugar and coconut in a large heatproof bowl. Make a well in the centre. Place the butter and syrup in a saucepan over low heat. Cook, stirring occasionally, for 8-10 mins or until melted and smooth. Remove from heat. Combine the bicarbonate of soda and boiling water in a jug. Pour into the bicarbonate of soda mixture and stir to combine. Pour into the well in the flour mixture and stir to combine. Spoon the mixture into the prepared pan and use the back of a spoon to press the mixture evenly into pan. Bake for 25-30 mins or until golden. Cool in the pan. Cut into squares and drizzle with white chocolate. Refrigerate until chocolate is set and serve.